Because there is fighting in my country. Because you have a good life. And was a widow at 22. With no one to help him. And my mother was too young. And no chance to marry again. Yet she tells me to be happy. Now I am in a school with many friends. They say, Let’s play a game! Let’s just sit and talk! Talking makes me so happy. And so does taking pictures at school. And finding ways to be happy. A brave poem, and I feel I know you, Madia, in your writing. I hope you keep writing and continuing to learn. Your strong spirit make me happy! Brava, Madia. This poem is so moving. I read it and I am just so happy that you are where you are, and that you get to study, and that you can be with your friends, and that writing and reading and taking pictures brings you joy. May this always be. May you always have opportunities to grow and learn, to become the best Madia you can be! A joy-filled poem from a joy-filled girl. Your mother is wise beyond her years and obviously has an unshakeable spirit. Thanks for sharing her wisdom in your lovely poem. You are the brave one. I am really happy to hear your poems reading and your stories. Your poem is powerful, Madia. Thank you for a most inspiring reminder of life’s most important lesson. Sometimes I can forget how easy happiness can be attained. Your poem brought me, through reading, how a simple conversation with a friend, which you prompted me to have after reading your work, can enlighten us to joy. I hope to read more of your wonderful art. This poem makes me happy. I wish there were more poems in the world that do that. Thank you. Keep on doing what makes YOU happy! Madiha, I am so glad you shared this poem. There are some parts of it that make me sad, but there are also parts – like in the end – that make me happy. I like that you have found things that make you happy. Make them yours forever… and keep writing! And so, from me to you, lots of optimism! I wish that I could send you mountains of happiness! But I can send you my best wishes and congratulate you on your success for writing such a lovely poem! 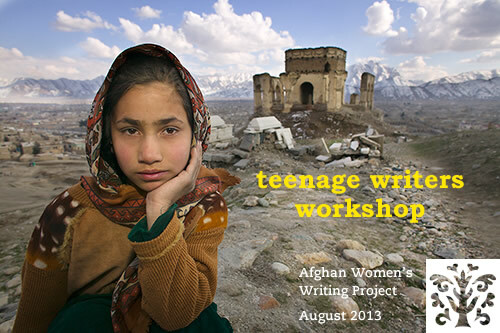 I am so much thankful from AWWP for working with all of you and for the wonderful idea of gathering stories and poems of teenagers in Afghanistan. I hope that at least some people support you and your writings so that you could write more and more in the future. I am proud of you, Keep up the good work! Wow that poem was really nice. I really like the way that your spirit never broke and that you managed to stay happy. Impressive, that poem was very inspiring . I hope that more people will read you poem and do what you do. That way, less people would be unhappy. Great poem, Madia! I hope you continue to write and feel happy! I really liked your poem and it made it even more impressive since you’re only 14. Continue to learn and write! Best of luck! I felt sorry for you, but your mother is right, always be happy no matter what situation you are in. Happyness can make one’s life better, so always tink positive and always be happy like you are right now. To be honest with you, you are a very tough little girl. your mother must be so proud of you. Whatever the situation there is always a possible reason to be happy again, like your mother said be happy! Happiness is a huge word that can pick people up if they are in a very tough world/country that is around them, happy can show those who are unhappy to be happy and enjoy whatever life they are given. I am truly inspired by your poem. I am a 14 year old student from Auckland Girls Grammar School in Auckland, New Zealand and we have been learning about Afghanistan in school. This poem is incredibly beautiful and I hope that you, your mother and your sisters find every happiness possible. I hope you live happily. Thank you for sharing your story.